Once you have enrolled on your course, one of our dedicated Learner Support Tutors will contact you to introduce you to the learning and support systems that are available, and to explain how you can best prepare for your practical training days. Many of our students are a little apprehensive about the distance-learning element of the courses, especially if they have never studied this way before. Rest assured however that we have a proven track record in this area are considered by many as masters in deploying training and learning solutions remotely, in a distance-learning fashion. Unlike many other training providers, we have specifically designed and produced all of our own teaching and learning materials with your success in mind. We haven’t taken the short cut of using the standard, generic materials offered by the awarding body; instead we have invested a great deal of time and money in producing our own materials to ensure that your learning experience is constructive, enlightening and enjoyable. While each of our training programme are modified to suit your individual circumstances and learning needs, a summary of how the distance-learning typically works has been provided below. Following your induction, you will need to undertake approximately 4-6-weeks of pre-course distance-learning, which is based on an average of 1-hour per day. Your learner support tutor will discuss with you the best way to break down the course content and divide it into more manageable and bite sized chunks. When you feel that you have mastered a particular section of your course, you can opt to take one of the online multiple choice theory assessments so that you can assess your own progress an learning along the way. These assessments, which don’t actually count towards your final assessment, can be reset by your course tutor as and when you feel you would like a little more practice, and will automatically reset if you do not achieve the pass grade of 70%. Each question is cross-referenced with your training manuals, if you get any of the questions wrong, the assessment will tell you where to go in your manual to find the right answer. Contact with your learner support tutor can be appointment led or ad hoc, depending on your availability and the level of support you feel you need. Many of our students prefer to have weekly contact with their support tutor to get that little extra reassurance and clarification, others find it difficult to commit to appointments and prefer to call as and when they need assistance. Regardless of the level support you need, you can rest assured we are always at hand to provide further support as and when you need it. By the time you get to your practical training course, you will likely feel like you know the training manuals better than us! We strongly recommend that by this point that all of the online practice assessments have been completed and you have read through your entire training manual at least once. The practical courses are usually split over 2 or 3 weekends depending on the size of the course to ensure that you have plenty of time to prepare for any of your final assessments. The practical workshops, which are usually held at weekends, will teach you how to use and apply the knowledge you have acquired in the distance-learning phase practically to the fitness environment in which you are studying (gym, studio, outdoors). Once you have completed the final training weekend, it will likely take a few more weeks for your final theory exams results to come back from the awarding body, which in most cases is YMCA Awards. 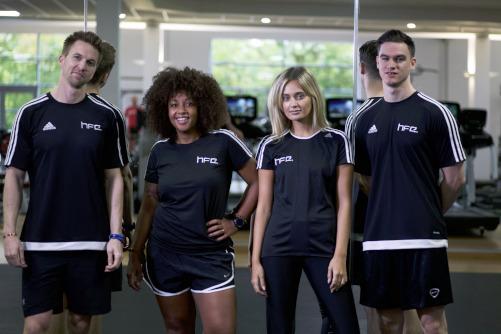 Once the results are in and providing that you have passed, you can then regard promote yourself as a fully qualified fitness instructor, personal trainer or otherwise, depending on the course you undertake. 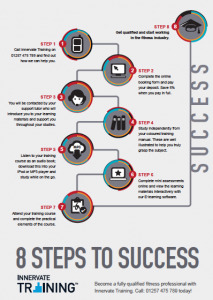 To review a summary of the above steps, click here to view our 8 Steps to Success graphic.